Explanation: On November 17, just an hour before sunrise, this bright and colorful meteor flashed through clear predawn skies. Above a sea of clouds this striking autumn morning's moment was captured from Hochblauen, a prominent 1165 meter high summit in southern Germany's Black Forest. Shining through the twilight, Sirius as well as the familiar stars of Orion are recognizable near the southwestern horizon, and the meteor seems headed right for the hunter's belt and sword. 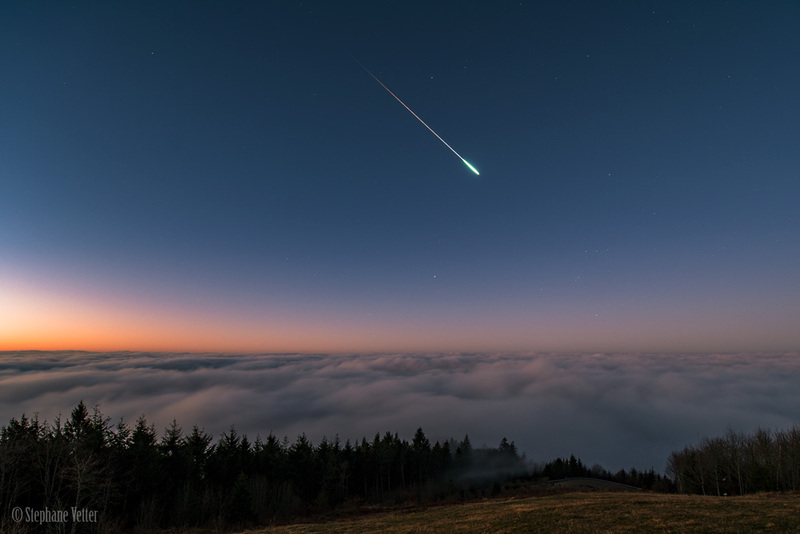 Still, as part of the annual Leonid meteor shower, the meteor trail does point back to the shower's radiant. The constellation Leo is high above the horizon and off the top left of the frame.